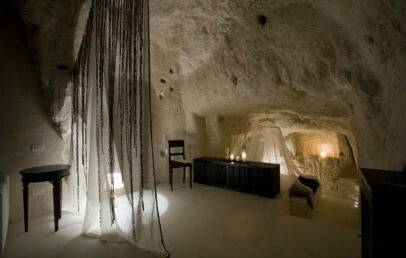 Matera, a UNESCO heritage is the frame of the beautiful Hotel Sant'Angelo, an Hotel that can give its Guests an extraordinary experience thanks to some rooms located in the caves, but not without the luxury and comfort always present. Recommended for couples of all ages but very dynamic due to the presence of stairs, steps and patios to cross the hotel. 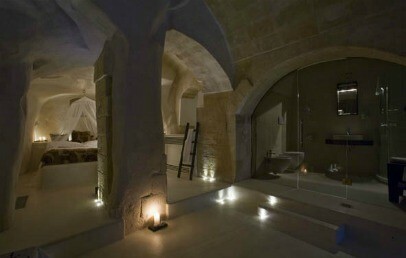 Sant'Angelo Luxury Resort is sourrounded by the charming and unique Sassi of Matera, meaning Stones of Matera, recognized and protected World Heritage Site by the United Nations Educational, Scientific and Cultural Organization. A historic atmosphere and a breathtaking scenery are the exceptional added value of the Resort, nestled among the tufa caves which lead to the Civita, the oldest part of the Sassi. The location of Hotel Sant'Angelo is a strategic starting point for visiting the city of Matera, the Murgia plateau and the finds of the ancient Greek colony in Metaponto. Sant'Angelo Luxury Resort is a hotel split into different buildings set around a central body, a decision dictated by the desire to preserve the beauty of the landscape. Two striking arches and a panoramic terrace on the Piazza San Pietro Caveoso surround the resort, while the rooms are reachable through a series of alleys, stairs and patios that become part of the eco chic style that characterizes the entire structure. A careful restoration work, with low environmental impact, has exalted the tufa rock walls that house an elegant decor and an enveloping and suffused play of light. 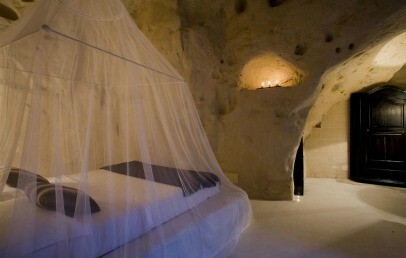 The hotel houses 23 historical dwellings made from the ancient cave-dwellings, and therefore characterized by rock or tufa walls (some are obtained from cave-dwellings, some are located in a modern building). Each dwelling is different from the others as the result of a craft that respects the uniqueness of the place. The furnishings are elegant, designed for each individual room, neutral colors and light prevail and the dwellings are equipped with numerous amenities and services. All rooms are from each other and difference is represented by square footage that will guarantee more or less spacious environments. The Deluxe double rooms are equipped with private bathroom, hair dryer, TV LCD and satellite channels, internet access, air conditioning, safety box and minibar. The Junior Suite rooms are composed by a large double bedroom and a private bathroom with shower or bath, only some of them have a small balcony. They are equipped with hair dryer, TV LCD and satellite channels, internet access, air conditioning, safety box and minibar. The Suites offer an extra space divided in a different way, respectful of the shape of the ancient cave-dwellings that host them, some Suites have a balcony while some others have a small lounge area. They are equipped with hair dryer, TV LCD and satellite channels, internet access, air conditioning, safety box and mini bar. Guests in Suites can also enjoy a wall video projection with DVD player for watching movies or listening to music. The Restaurant Regia Corte at Sant’Angelo Resort offers a soft atmosphere in an elegant and welcoming environment which gives its guests the chance to enjoy a sublime reinterpretation of traditional dishes. The Chef ensures the authenticity and freshness of its food products by selecting only seasonal ingredients from organic farming. The 5pm tea, aperitifs and the after dinner cocktails are served at the panoramic Terrace Lounge, which will enhance your moments of relaxation in the late afternoon and even more in the starry nights. Sant'Angelo Luxury Resort offers its guests many additional services, like for example the baby sitting and the possibility of having lunch or dinner in a private terrace. You can have all the information that you need about the places of interest in the area and book excursions to the rock churches, the Murgia of Matera, the Castle of Melfi or to the archaeological sites. Qualified and professional staff will arrange your job meetings for you at its Convention Hall, a meeting room host in a cave but equipped with the best technology. Sant'Angelo Luxury Resort is ideal for your most important buffets and receptions that will be organized following your preferences and special requests. The hotel has a covered, guarded car park, located in the upper part of the city (while the hotel is in the historic center, in a restricted traffic area) which cost is € 25,00 per day. Guests can comfortably drive to the hotel, where the valet parking service takes care of the car (bringing it back to the hotel according to customer needs). Double rooms with double bed. They can be obtained from cave-dwellings, characterized by walls made of rock or tufa, or be located in a modern building. The furnishings are elegant, designed for each individual room and neutral colors and light are prevailing. The deluxe rooms are and welcoming and are equipped with private bathroom with shower. Spacious double bedrooms with double bed. They can be obtained from cave-dwellings, characterized by walls made of rock or tufa, or be located in a modern building. The furnishings are elegant, designed for each individual room and neutral colors and light are prevailing. The Junior Suites are welcoming, with private bathroom with shower. Spacious double bedrooms with double bed. They can be obtained from cave-dwellings, characterized by walls made of rock or tufa, or be located in a modern building. The furnishings are elegant, designed for each individual room and neutral colors and light are prevailing. 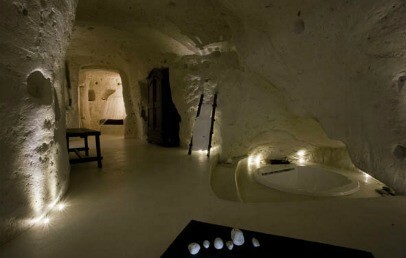 The rooms are divided in different ways, respecting the shape of the ancient cave-dwellings that host them. Some of the Suites have their own small terrace while some others have a lounge area. 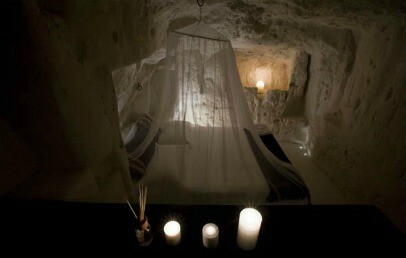 The suites are elegant and welcoming rooms with private bathroom with shower or bath.